Though I am lucky enough to get to stay with Imaginisce for another term, today I am bidding farewell to some of my Imaginisce Design Teammates who are moving on. If you have hopped over from the talented Rebecca Keppel's blog for our Goodbye Blog Hop, you are in the right place. I thought I'd use this chance to say a heartfelt "thank you" to all of my teammates for offering such inspiration and friendship to me this past year. A special thanks to Cari Locken, DT Coordinator Extraordinare and Bridget Bradley at Imaginisce for keeping us in fabulous product style! 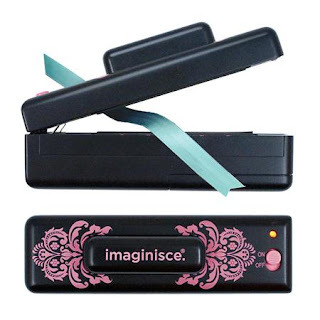 Imaginisce introduced me to a ton of new and very cool tools this past year, once of which is the i-Magicut Ribbon cutter. I used this nifty little device to create a ribbon wreath and I still love to look at it every day. Christmas Cheer is one of my all-time favorite holiday collections. 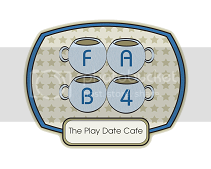 This layout above is one of my special ones that I created for my son's scrapbook. I loved the Halloween collection, Monster Mash, as well and I especially liked how it was a combination of cool and cute. This card was my favorite that I created with the collection. Here is a card I created using one of the newest Imaginisce collections, Love You More. 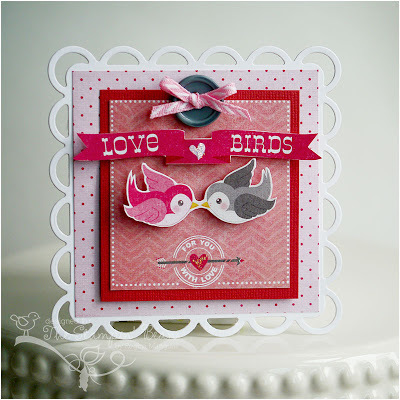 I really thought the grays and pinks were a welcome change of color scheme for a Valentine's Day collection and the birds are just darling. 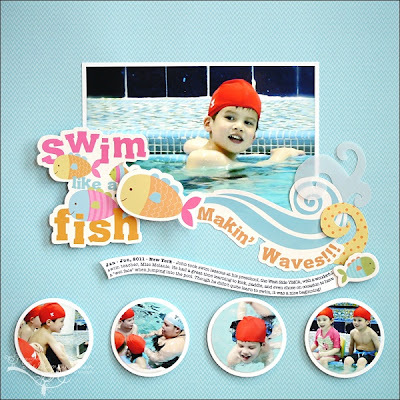 This layout I created using the Makin' Waves collection is near and dear to me because it is the first layout I ever published! This one proudly appeared in Scrapbook Cards & More. I'm so thrilled to be able to continue with this wonderful company for another year, but it will be hard to part from those amazing designers that are moving on to what is sure to be some very exciting things! Beautiful creations Regina - I especially love that ribbon wreath. Sorry to see you leaving the Imaginisce DT but look forward to still being able to see your TE creations! I've only recently found the Imaginisce blog, so this mini hop is a great way for me to see a short summary of the projects the DT have been creating. Esp. love that ribbon wreath. Loved your cards. They are sooooo cute. So pretty!! love your Christmas LO and that wreath is too cute! Your projects are wonderful! Really love that last card. Cute projects! 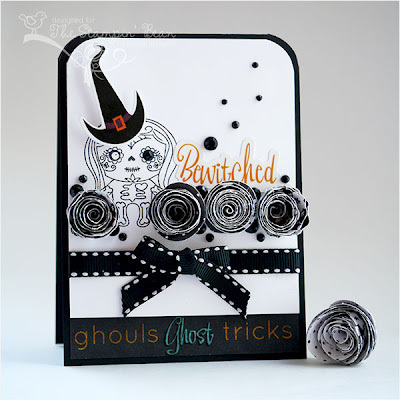 Love the Bewitched card!! Great projects! They are all so different yet beautiful! 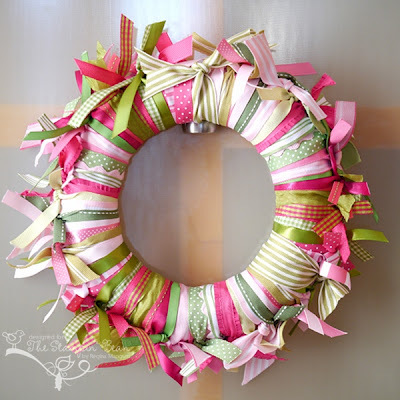 I love your ribbon wreath and can see doing it in different color schemes for other holidays or locations in a home. Thanks for sharing! I really like the swimming layout above and the ribbon cutter is my favorite tool too. It will be fun seeing what you and the new team will be doing next year, but I'll miss the 2012 group. Gorgeous projects! Looking forward to seeing another year of projects from you. :-) Congrats on the 2013 team! Fun projects! I am glad you will still be on the team! I love all of your projects, thanks for sharing! I'm glad you'll be able to continue on! 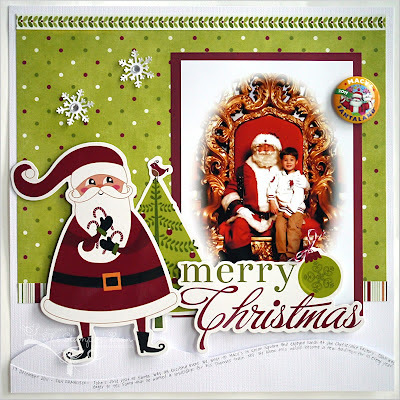 What a lovely wreath, great LOs and cards you've shared here! 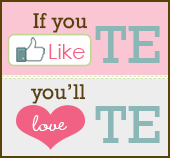 I can't wait to see what you have to share in 2013! I love that wreath and the last splash layout, so glad you are staying on for another year! What a splendid wreath! Also loved the last layout, great idea for a swim page. Fabulous creations--love the ribbon wreath. These were some of my favorites of yours this past year too Regina! Love your style and you constantly inspire me. Looking forward to this next year with you on the team again! Thanks for all the great papercrafting ideas! I have the ribbon cutter! Love it! wow awesome projects! There are so many that I'm just in awe! Thank you for sharing! Love your projects.. especially the swimming layout. Making WAves is one of my favorite collections. :) Thank you for sharing your creativity and love of Imaginisce. I've always enjoyed your projects! So inspiring! Congrats on a 2nd term on the team! I'll miss being on the team with you Regina, but I look forward to seeing what other fun things you make for Imaginisce this coming year!! Lovely projects, congrats on your publication!! Awesome projects, specially the ribbon wreath, how gorgeous is that! Thanks for sharing and for the chance to win, hugs! Girl...you have a way with paper and I am so lucky I still get to work with you! Looking forward to 2013! So glad to hear that you will be staying on in 2013 Regina....I am greatly inspired by your work. Regina, I am such a fan of your work, it's always amazing!!! Can't wait to see what you create in 2013! Love the things you have made with the products. You are great and I wish you luck in the coming year! You have amazing projects Regina!! I am so glad you stayed. I'm so sorry to see you go but what a way to go out.. in a bang of projects. Love your wreath with beautiful color scheme! I love the wreath, but it's the cards which had my mouth drop open! They are adorable! Yay for Imaginisce stamps! great projects, love the wreath! YES! I'm so glad you included that Makin' Waves layout...I remember it fondly as a favorite :) All the very best to you, Regina! I always looked forward to seeing your creations...always so sweet and clever! Beautiful projects, love the layout!